Ed Newbold | New Orcas; We go to press! New Orcas; We go to press! 14 Mar New Orcas; We go to press! 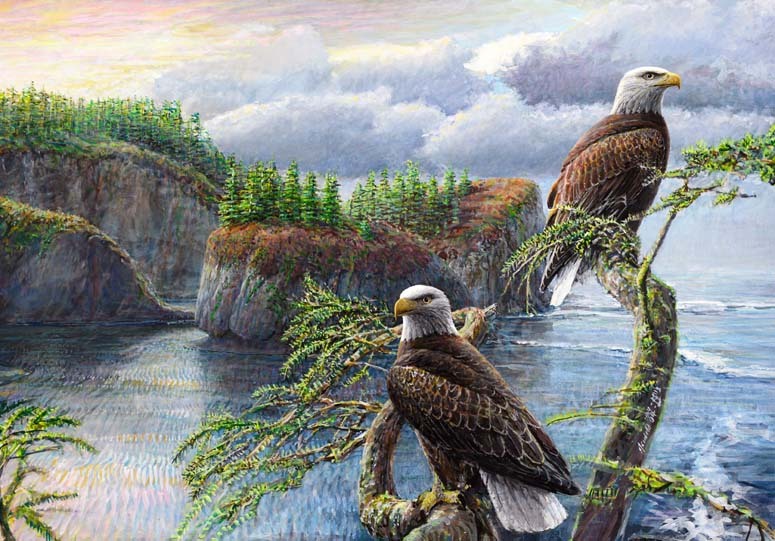 It’s been a busy time here at Ed Newbold Wildlife Artist as Poulsbo and Seattle Birds are now published and a new painting Orcas in the Salish Sea is now at the store in three sizes. Orcas in the Salish Sea painted fast. That’s a good sign. The last painting that painted that fast was Company, one of my “greatest hits,” painted in 1988 in less than a month, and also of above-the-surface Orcas. 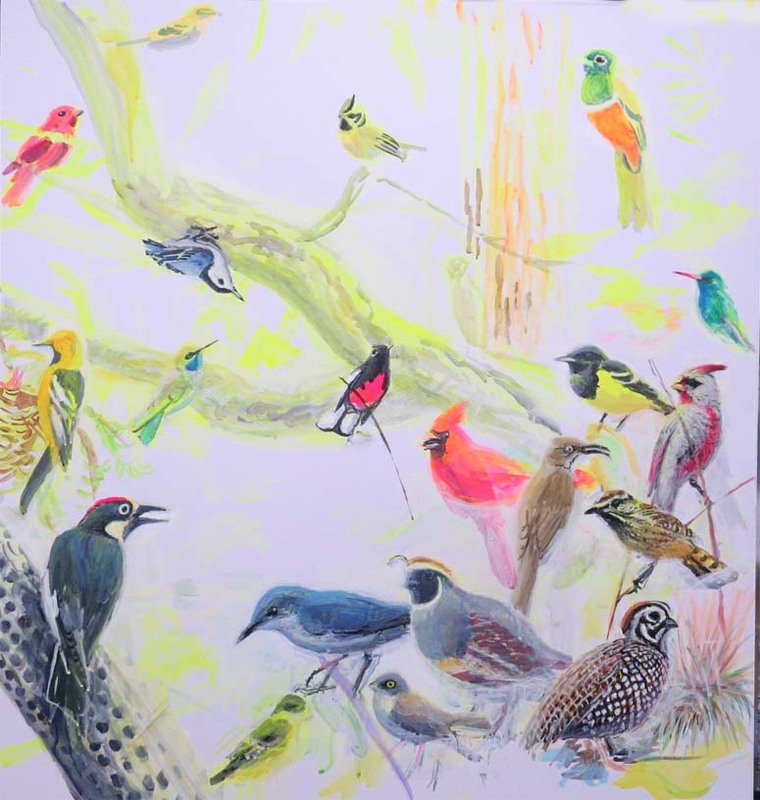 The question there is will this new painting hold in its present configuration or will my response and the public’s response induce me to start the tweaking process in earnest. It was painted on foamcore, hard surfaces are good for speed. Orcas in the Salish Sea will be available in two sizes on the website soon. Poulsbo is now published and after extensive market research, the name has been changed. Since the Poulsbo Chamber of Commerce isn’t sending us any retainer checks, we are no longer going to be in the business of explaining what the word “Poulsbo” means. 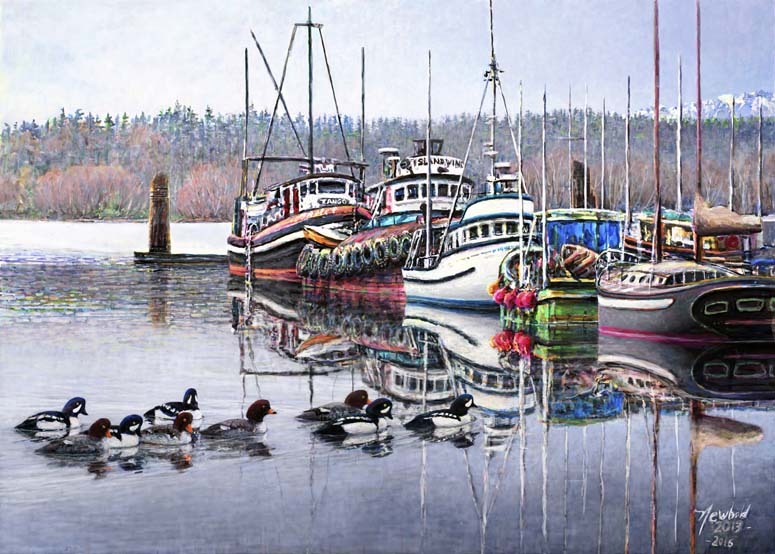 I’ve been going through names and titles and this one wasn’t easy but the one we settled on is “Winter Respite.” It refers to the fact that the boats in the harbor may be there for a “winter respite” from fishing up north, the Barrow’s Goldeneye in the picture are in a “winter respite” from the rigors of the breeding season in the northern mountains, and since the day is clearly pleasant and the wind is still, it is a “winter respite” from the rain storms that pummel Kitsap County in the winter (but never Seattle!) Winter Respite should be for sale on the website under “SHOP” and “Larger prints” by sometime today. 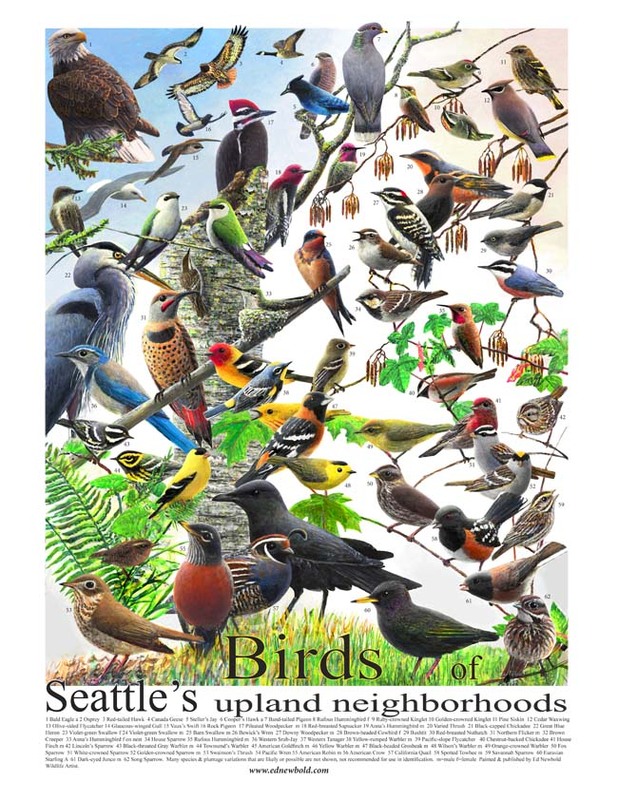 Birds of Seattle’s Upland Neighborhoods is also now published. It should be on this website under “Posters” and “larger prints”. 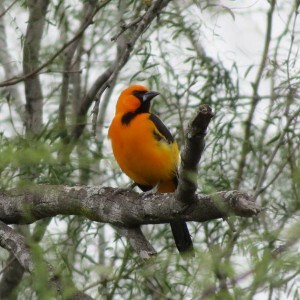 I don’t know if I mentioned it before, but Characteristic and Specialty Birds of the Chiricahua Mountains (Arizona) is underway. This one isn’t going to be done in three weeks, that’s for sure. Here’s what it looks like now, it seems to be immediately presenting many issues and problems. But I like painting on foam core, the paint doesn’t sink in like on a spongy canvas where you paint in detail, walk away, and the detail has wicked and blended away.